The photograph shows five men harvesting opium a couple of hundred metres from Camp Bastion perimeter defences, seen in the foreground. 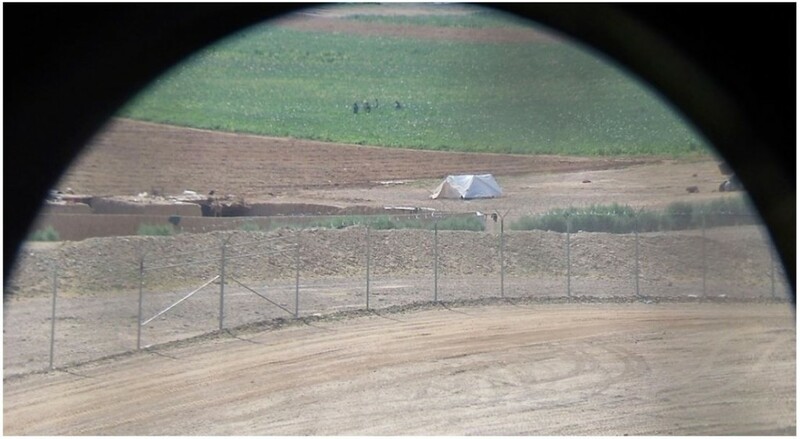 Not only was this illegal drug production being carried out in the shadow of ISAF’s Main Operating Base, it was being done under the protection of British soldiers. Her Majesty’s Armed Forces (Army and RAF) were protecting this man’s cash crop from illicit ‘taxation’ by the Afghan National Police or Army. The duplicity is in what the Ministry of Defence tell people we are doing, and what we are actually doing. As this photo was taken there was a World Service edition of ‘From Our Own Correspondent’ playing. The particular BBC correspondent, Quentin Sommerville, was ‘embedded’ with British soldiers in Helmand, who were assisting in the destruction of poppy fields. This must raise the question as to why poppy fields on the edge of Bastion’s airfield were protected whilst another farmer’s crop in a neighboring valley was destroyed? The land in the once barren valley was now watered by the effluent of the 30,000 people living in Camp Bastion, creating a mini property boom for the owner of the land, a Mohammad Daoud. The valley bordering Camp Bastion’s airfield had become a busy agricultural area, with parcels of land rented out to tenant farmers, migrant farm laborers camping a hundred metres from the defences, plus all the associated traffic. Whether this is the same Mohammad Daoud as former Governor of Helmand Province Mohammad Daoud is yet to be confirmed. If confirmed, the irony of former Governor Daoud having previously championed British poppy eradication efforts would illustrate our corruption accurately. 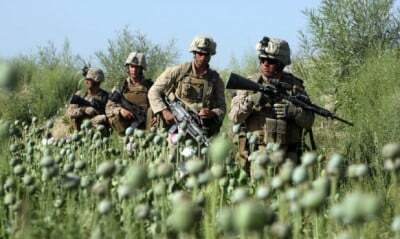 Unless the international community includes poppy eradication and fighting drugs in their list of ways to fight terrorism, they will not succeed in this fight because it (the drug trade) is the fuel in the machine of terrorism. Our incompetence is best ‘illustrated’ by the deaths of two US Marines, Sergeant Bradley Atwell and Lieutenant Colonel Christopher Raible, and the destruction of £200+ million worth of equipment, in the Taliban’s audacious airfield raid of 2012. The attackers of 14th September launched the raid from this same valley, where despite it’s proximity to £££Billions of aircraft across the airfield, the Command appeared to assess the risk there as minimal to non existent. This ‘lax’ attitude (criminal negligence in my eyes) reportedly extended to not providing any night vision equipment to soldiers guarding the airfield on a moonless Afghan night. To describe this as simple ‘incompetence’ is being very generous indeed to those responsible. Two men are dead because the British Army and Royal Air Force failed to protect a stationary target – an airfield. I can only apologize for my part in that. Author: Anthony C Heaford, Craftsman / Vehicle Mechanic in British Territorial Army 2009 to 2013, No.30088729. Six month tour of Afghanistan, April to October 2012. Based in Camp Bastion.